This is what I have been eating for breakfast every morning. 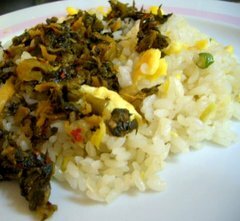 Egg fried rice with preserved mui-choy. There were plenty of other choices in the buffet spread, but I really liked the spicy and mildly salty taste of the preserved vegetables. We ate quite a few meals in the hotel coffeehouse since that was what the organisers arranged. Trouble was, the buffet spread remained the same so it got extremely monotonous after about the 3rd meal (excluding breakfast). Colleague was approached by the resident manager for comment, and she told him she was sick of the food. The manager, who happened to be from Singapore, was quite efficient because there were new dishes served at lunch the next day. My gripe with the hotel was not food-related. In fact, the South Vernal restaurant at the second floor serves excellent and very refined Shanghainese dishes- our simple dinner of dumplings and cucumbers in garlic sauce turned out to be the best meal of our trip. Anyways, it seems that the city has a considerable power supply problem. At least 2 power outages happen every day; the hotel generator then kicks in but the aircon is not turned on for at least 30 minutes after each outage. It being high summer does not really help either. After three days of lamb and more lamb, the tastebuds hankered for something a little more fresh-tasting. Not knowing where to go, we decided to explore the area around Parkson's for a change. Parkson's did not have any restaurants so we crossed the road and found ourselves in a five storey building that is made up of eating outlets. Settled into a restaurant on the second floor. 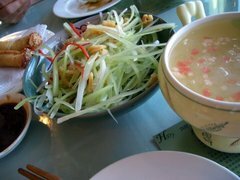 Cool strips of julienned celery tossed with dried shrimps and a cold soup of snow fungus and red dates were just the thing in the hot weather. But the ugly pumpkin eight treasure rice was plain awful- the syrup reminded me of the rice glue that kids play with in kindergarden, well at least kids of my generation. A more elegant and far tastier version can be found at the South Vernal at our hotel- the syrup light, the toppings of quality red dates, fruits and nuts very flavourful and a smooth layer of red bean paste in the middle a delightful surprise find. 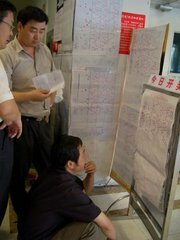 Above: a group of men studying the lucky draw analysis at Parkson's. Some street scenes below. 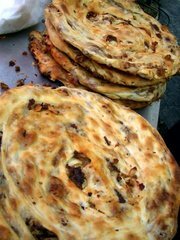 The round bread is called nang and is cooked in the tandoori-like oven all over the city. Fruits are plentiful, girls eat watermelons by cutting it in half and scooping the contents into their mouths directly. 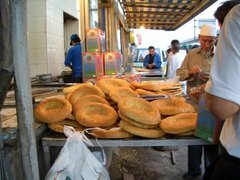 On the third day I found myself at, again, the Grand Bazaar area and Er Dao Jiao. 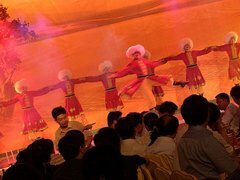 This time the organisers had arranged a group outing for dinner and cultural performance. The food was bad, think pig swill. 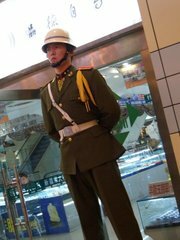 There was a traffic jam at the lifts because of this guard standing at attention outside the jewelry shop. He could not quite carry off the statue effect because his eyes were popping out in a crazy fashion. 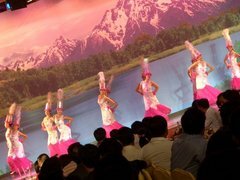 But the cultural performance made up for the bad food. They do try to romanticize the minority tribes, you know, the gallant horsemen, the beautiful maidens, there was even a Cinderella item where Cinderella is a man! But I didn't cringe at the performances, it was less getai, more "chorus line" and the dancers, male and female, mostly very beautiful. 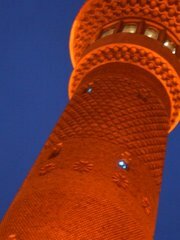 The mosque is lit spectacularly at night. Every person with camera was trying to capture a good shot. Wall detail taken just before the sun set. 1. Official working hours start from 10 am. Urumqi is 2 hours behind Beijing but it follows Beijing time. So everyone starts work at Beijing 10 am. That confused me quite a bit, but really, isn't it a civilised way? This could well suit me as I am not a morning person. 2. The sun usually sets around 10 pm. The days are long, and the nights short. The long hours of sunlight is good for farming, they say it is what makes the fruits sweet and the flowers beautiful. 3. 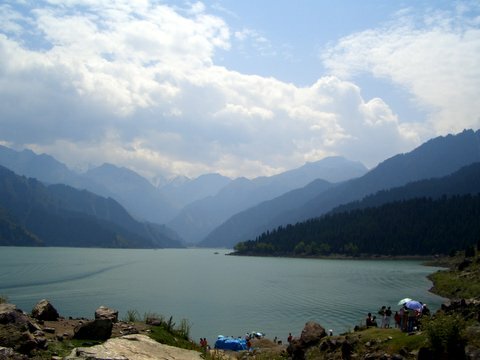 There are more than 40 minority tribes in Xinjiang. The two biggest tribes are the Uighurs and the Kazaks. 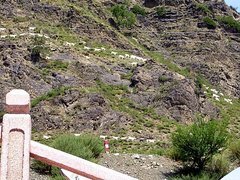 The province itself is bordered by 5 countries- Pakistan, Russia, Mongolia, Kazakstan and Uzbekistan. Hence the diverse culture and lifestyle that is vastly different to rest of China. 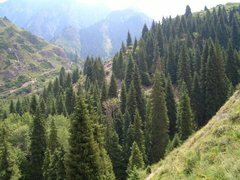 The nearly 2 hour drive took us through the evolving terrain between the city and the Tian Shan (Heavenly Mountain). The edge of the city is sandy and bare, then the scrubs appear, with an occasional camel or two. Alex says the province gets 16 mm of rain per year, i.e. very little indeed. The scenery reminds me of Condor Heroes wuxia stories set in the grasslands and deserts. After waiting with millions of other mainlander tourists in the scorching heat we managed to get into the cable car and up the mountain. Some parts of the mountain is still covered in snow. The snow is the reason why agriculture remains viable even though the annual rainfall is only 16mm. 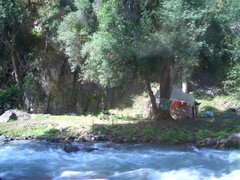 In spring the snow melts and the water flows downhill. 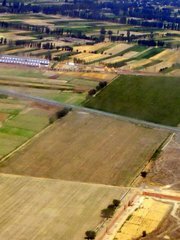 A canal system diverts the water to the farmlands. 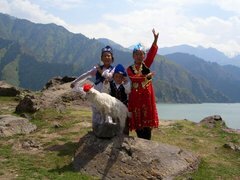 On right: Dressed up sheep, cute little boy and two precocious girls charming everyone into taking a picture of them for some pocket money. Note to self: buy stuffed sheep. The water in the lake was as clear as a mirror, and very cold. Beyond the lake is a monastery. 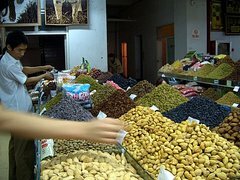 In the afternoon, Alex took us to the grand bazaar area at Er Dao Jiao where we had gone to the day before. No cute stuffed sheep, instead I bought a rug woven with a grassland scene. 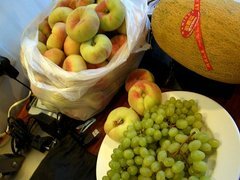 Returning to the hotel I was most pleasantly surprised to see on my table some very beautiful local produce- sweet donut peaches, seedless grapes and a whole Hami melon. Was somebody reading my blog? 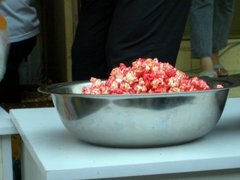 No, the fruits were a gift from the city officers to the participants of the meeting (that I am helping to coordinate). The Hami melon was gorgeously sweet and juicy, totally different from the soapy tasting cubes served at the breakfast buffet. The peaches and grapes also spectacularly good. 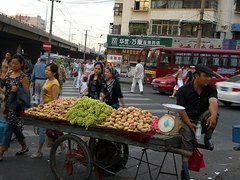 This easy availability of fruits is really endearing, I remembered that it was so difficult, and expensive, to purchase fresh fruits in Shanghai. Who knows, all the lovely fruits and the fresh almonds from the bazaar might improve my health before I return home? 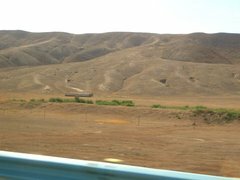 It took my colleague and I twelve hours to travel to Urumqi. The overnight flight to Beijing was smooth and I even managed to squeeze a couple of hours of sleep in-flight. The Beijing airport is big, poorly sign-posted and staffed by people who answer with grunts and annoyed voices. 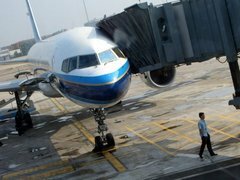 We nearly couldn't figure out that the China Southern airlines flew off from a separate terminal located quite a long walk away. 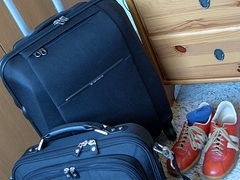 It was a good thing we did not have much luggage. Our flight was to depart at 9.20 am. There is a flight out almost every hour, yet our flight was full. My colleague was saying that our tickets were bought at an exorbitant rate, for the S$1000 we could have travelled to Hong Kong twice. Local passengers apparently pay about 80% less. 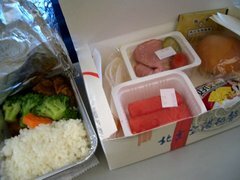 The other surprise was the airplane- it was very small, and packed so tight I now fully emphathise with the canned sardine. I chose the beef rice for lunch, very unappetizing it was. It came with a standard box of ham potato salad, stale roll, watermelon wedge and what I call Vicky Chao cookies because her photo adorns the packaging. 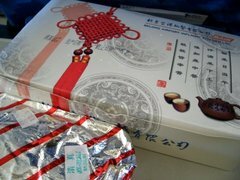 The cookies were the nicest thing in the box, and that is saying a lot. 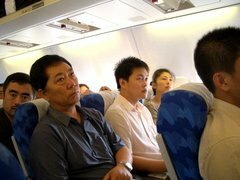 So, the flight continued in the same unpleasant fashion, don't know why but the passengers kept changing seats, hacking and coughing without covering their mouths, and, going endlessly to the loo- with the last observation in mind I declined all the attendants' offering of beverages. Finally, the three odd hours in the cramped and stuffy cabin came to an end. The view from the window was beautiful, from what little I could observe from my aisle seat. 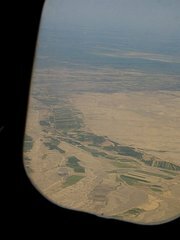 The dunes and sand of the Gobi Desert gives way to neat plots of agriculture. The sky was startlingly blue and the temperature blazingly hot at 33 degrees C when we touched down. The relative lack of industrialisation means the air here is less polluted, i.e. the insides of my nose doesn't turn black so quickly, than the cities along the coastal east. The Yin Du Hotel staff met us at the airport and within 20 minutes we were checked in. Rooms are spacious and comfortable, mine has an ugly view of the back of a hospital and an energy tower. We changed out of our travel clothes and explored the city a little. 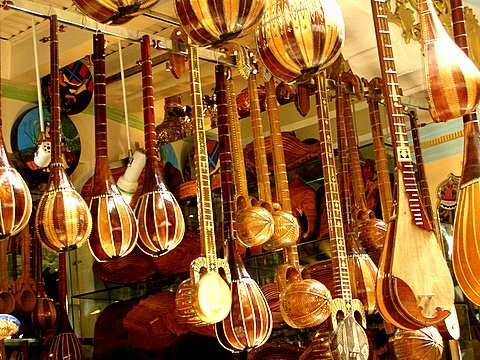 The concierge suggested The Grand Bazaar, where there are on sale arts, crafts, medicinal and fashion items of the minority races like Uighur and Kazak. The place felt very touristy but today there isn't many tourists around. We did feel as if we were in a country other than China though, e.g. Turkey, because there are very few Han Chinese around. The Chinese Muslims have caucasion features like more sculpted cheekbones and deep set eyes. The men sport moustaches and the women wear long dresses and either cover their hair or secure them with sparkly hair accessories. They also speak Mandarin with a distinct musical lilt, like how an Westerner would speak it. Most stallholders are very friendly and not as persistent or obnoxious as their Han counterparts. Raisins come in all colours, shape and tastes. I bought some to snack on, eating some as I am typing this entry. I was dying to try some Hami melon but my colleague reminded me it was probably not a good idea. Well, if the hotel does not serve it at breakfast tomorrow, I will buy a whacking big melon and a knive and hold a melon party in my room. It was really hot and we were melting faster than the Turkish-style ice creams sold here. Colleague suggested an early dinner. She randomly chose a place and I followed, but not before taking pictures of the mutton breads and the friendly outdoor cooks. 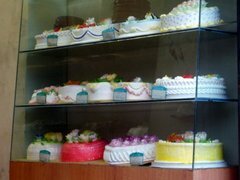 The restaurant has a highly decorated look, a bit granny-like but thankfully not in the least tacky. The staff happened to be eating their dinner. 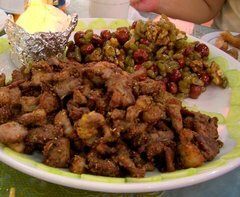 Other than the delicious mutton bread, which was studded with loads of juicy mutton and caramelised onions, the waitress suggested the house special (left)- a combination of mutton stirfried with cumin and other spices, and dried fruits tossed in a (highly redundant) sweet coating. The mutton was tasty alright, but the amount was too generous we hardly made a dent in the pile. 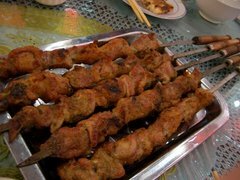 The waitress delivered 5 skewers of grilled mutton to our table by mistake but we didn't realise that it wasn't what we ordered and ate about two sticks. Washed down all that meat with the rose-infused tea, and a side order of bottled pomegranate juice. The pomegranate juice was not too sweet, and its mild tartness was really refreshing. Like the rest of the country, the people here do not let anything go to waste. 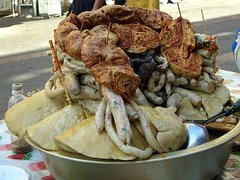 Steamed goat lungs and rice-stuffed intestines anyone? Off to Urumqi via Beijing tonight. For work. Will be away for a week. 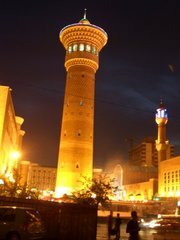 Urumqi is the capital of Xinjiang Province in the northwest part of China. 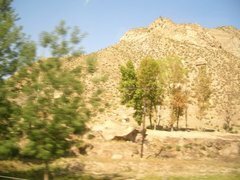 An area rich in natural resource like coal and oil, and well known for its Hami melons and white seedless grapes. The weather right now is very hot in the daytime and cooler at night. 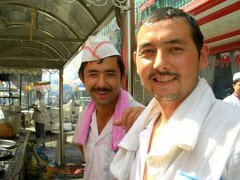 The Uighurs, rather than the Chinese, are the majority race. Must try their local bread and bbq mutton. Oh, and try to get some work done. Called 4th sister last night to check she is OK after the repeat London explosions. She is fine, and coincidentally, will be in Beijing for a holiday next week, arriving the same morning as my return flight to Singapore. On impulse, I decided to delay my return trip and spend a day with her in Beijing until her boyfriend arrives from Tokyo to join her. 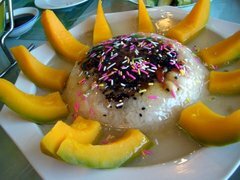 My friend slurp has posted very yum-looking pictures from the July makan outing at Liang Kee. Click here. husband: Eh dear, you went shopping ah? umami: No lah, I went to the Food Bloggers Lunch and I won the cocotte in the lucky draw. 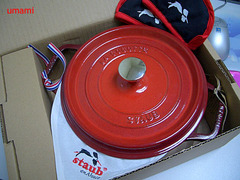 The organisers know a sponsor, BATS Singapore, who gave really good stuff, like Chroma knife and this Staub cookware. Don't know why leh, all the four prizes went to the people sitting on my side of the table. husband: So good ah? When did this happen? umami: This afternoon. Lucky I did not go to the outerspace Boon Lay office today. We started at 12.30 and didn't finish until after 3.00.
husband: Nice, but why such a long lunch? umami: Plenty of food mah, 5 courses leh. They served champagne too, my head was still buzzing when I got back to the office. All the bloggers were really warm and friendly, we talked and laughed a lot. After lunch, Julia took us shopping at the nearby Korean supermarket. Oh yar I left my goody bag behind, lucky I was still in the neighbourhood and could return to the restaurant to collect it. husband: goody bag some more. Wow, your lunch sounded more like dinner and dance. 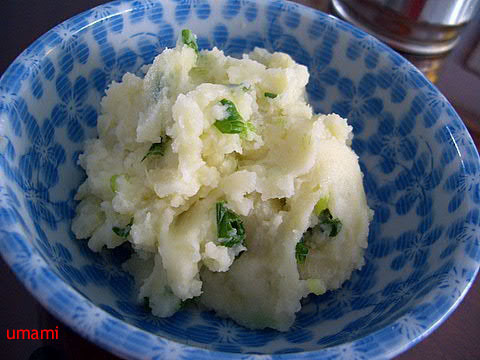 umami: Yar loh. It was beyond my expectation, when I received the email invitation I thought we will all just sit down, eat and get to know one another. Which we did, but it was all so fun. The organisers joone, chubby hubby and gwenda certainly did a fantastic job organising the event. I had a grand old time. husband: Wait, where did you eat? umami: Mag's Wine Kitchen. The food was excellent, I especially liked their smoked duck. psst, Chubby Hubby has all the lovely food pictures in his post. Yesterday my face appeared in the newspapers. As the Greediest blogger at the local blogger conference. Can just imagine the thought bubbles in colleagues' heads now......hope they don't hide all the tidbits when they see me approaching. Actually I was more disconcerted that I was nearly the oldest blogger there. Some of the participants were not even old enough to drink. If mrbrown is considered a grandpa, and he is nearly my age (I am now 36 if you have not read the articles), then I can be considered a grandma. If the reporter had asked me two weeks ago, at least I could say I am 35. But two weeks ago I did not have lovely birthday pressies from husband ( Casio Exilim and Samsonite cabin luggage with 4, yes, 4 super-duper wheels), cards, MMS greetings, family birthday party and being taken out for more than a few birthday meals. Why, just last Friday, we even had the privilege of being invited to my dear friend S and D's home for an indulgent home-cooked dinner. So, I shouldn't really complain about my age, no? D, besides being a mum, wife and career woman , is an excellent cook. Her tiramisus are extravagant, her roasts gorgeous. For dinner last week, she totally spoiled us. First she gave us each a bowl of creamy mushroom lava which had a sizeable piece of Cambozola melted in for a wickedly pungent bent; we couldn't dip our breads in it fast enough. All that richness was crying out for wine, luckily S had earlier decanted a bottle of Voyager Estate 2001 which was a most perfect match. Next we moved on to tender roast lamb, pasta and asparagus bathed in anchovy butter. Husband poured the Leoville Barton 1998 he brought along. It initially tasted of ink and much murkiness, oh poor husband was mortified to hear me say that but after more airing the wine drank better. But not as nice as the Voyager. The husbands then got into a long and spirited wine-geek conversation. S showed us his wine fridge and the two of them convinced themselves to open yet another bottle of wine. The Majella 2001 turned out to be the favourite wine of the evening. It had a most prominent nose of berry fruits and jam, loads of blackcurrant and fruity tastes, and was satisfyingly long-lasting on the palate too. By then D and I had quite enough of wines, and needed to eat more food to counteract the alcohol, so her apple crumble spiced with warm cinnamon and cloves was much welcomed. We also devoured the rest of the Cambozola. Heck, it was a Friday evening. So the reporter was right after all, I am the greediest blogger. An old and greedy blogger, woo hoo. Cheers! There was baked pork ribs for lunch, but the potato salad was more popular. Surprise ingredient? Lady's Choice mayonnaise, which seems to be only available in Malaysia.